If you will be traveling, or perhaps need to access your mail from another computer, you may do so via any web browser. 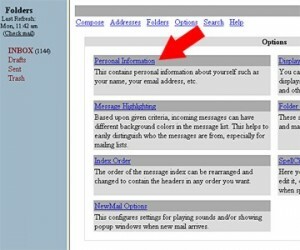 To access your mail via this service, you will need to know your account name (how do I find my account name?) and your password (how do I find my password?). Once you have arrived at the NetTech interface, you will see this menu. 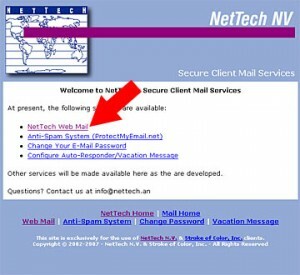 Choose the first option, NetTech WebMail. You will now be at the login screen, where you will have to enter your account/username and your password. Once you have entered these, hit Login, and you should be taken to your mail where you’ll be able to read mail, delete mail, respond to existing mail, or compose a new mail. 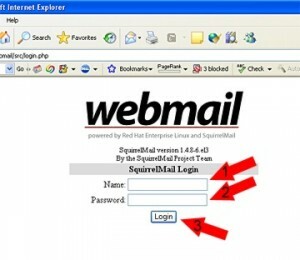 If this is your first time using WebMail, then you will have to make one configuration prior to sending any mail to be sure your recipients answer to your correct email address. From the WebMail main menu screen, click on Options at the top. 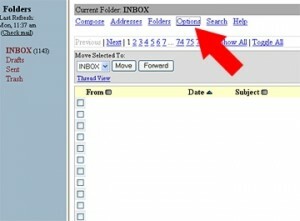 Finally, enter your correct email address in the box indicated by the red arrow. You may also enter whatever other information you desire at this time. Then hit submit, and your configuration will be complete. 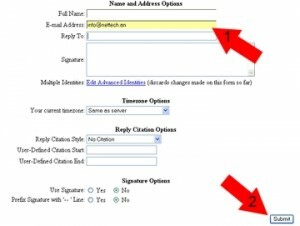 You must only do this once, and, after configuration, the correct email address will be stored.